…Be afraid of when the aircraft suddenly STOPS flying. 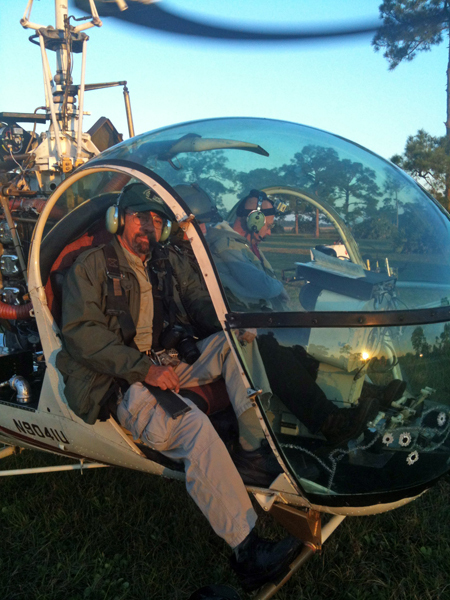 Yesterday, my friend John Strayer and I went aloft to try our hand shooting feral hogs from a helicopter with .44 Magnum revolvers. Our mutual friend Norm Ambrozy, who had arranged the hunt, was on the ground awaiting his turn in the little Hiller, a UH12B I believe. This increasingly popular – and by all accounts, exhilarating – method of pest eradication has come about from overpopulations of the wild hogs absolutely destroying farmland in several parts of the country. We thought it would be even more challenging with six-shooters. It’s normally done with AR15 sporting rifles and, yes, those evil “large capacity magazines” which so upset the White House. 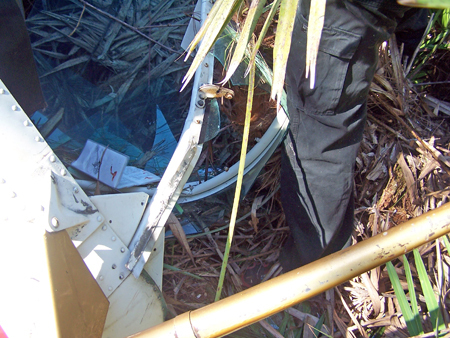 A few minutes into the flight, as we were zoning in on an oinker that had run under the canopy of some tall pines, the engine lost power. 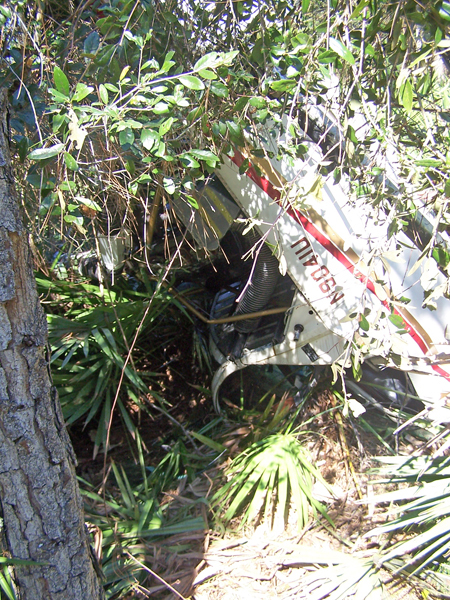 We won’t know exactly what happened until the FAA completes its investigation, but when the main rotor hit the first treetop, the die was cast. Autorotation doesn’t work without rotors, and you all know the old joke about a helicopter’s glide path. We ended up nose down and kinda upside down. And grateful to be alive. I’d like to also personally publish my gratitude to those who expressed concern when they heard about it on the Internet, and to the pilot, Graham Harward, who “brought us back alive.” Cuts, bruises, pulled muscles and stiffness, but since none of the stiffness involves rigor mortis, ain’t none of us complaining. 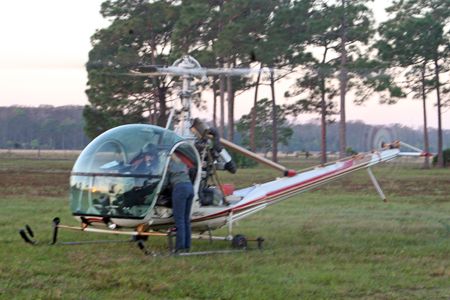 The helicopter warms up and pilot performs pre-flight checklist. One of the ground crew snapped this shot just before liftoff, showing dimensions of cabin. From left: Mas, pilot Graham Harward, and John Strayer. 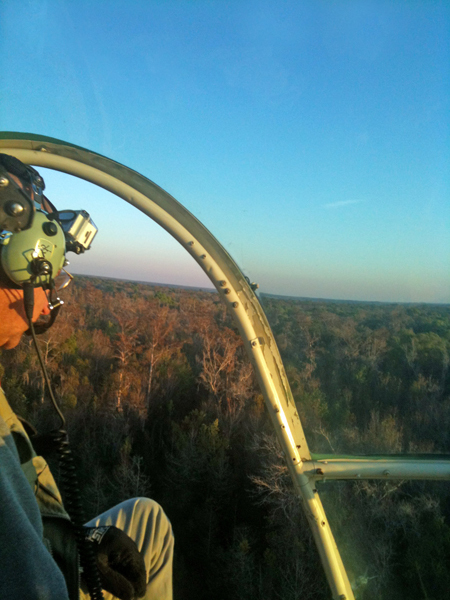 Heading out for hogs, at about a thousand feet, from inside the Hiller. The last photo from inside the cabin before power was lost, showing approximate elevation when engine failed. John has his eye out for the hog he just spotted, and camera does not show the S&W .44 Magnum in his right hand. He never lost it throughout the crash, holstering only after he extricated himself from the downed bird. His index finger stayed outside the trigger guard, and his muzzle in a safe direction, the entire time. Final resting place. That’s broken tail boom and what’s left of tail rotor at upper left, landing skids on upper right. 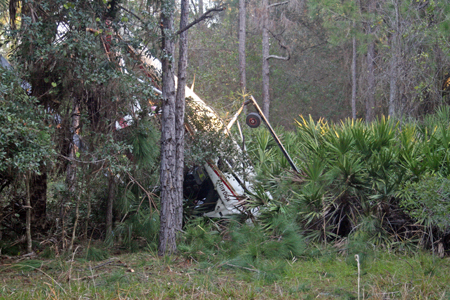 Crushed nose and cabin on port side, where John crawled out after crash. Mas and pilot exited from here, on starboard side of crushed cockpit, now pretty much upside down in palmetto. Minutes after the crash. 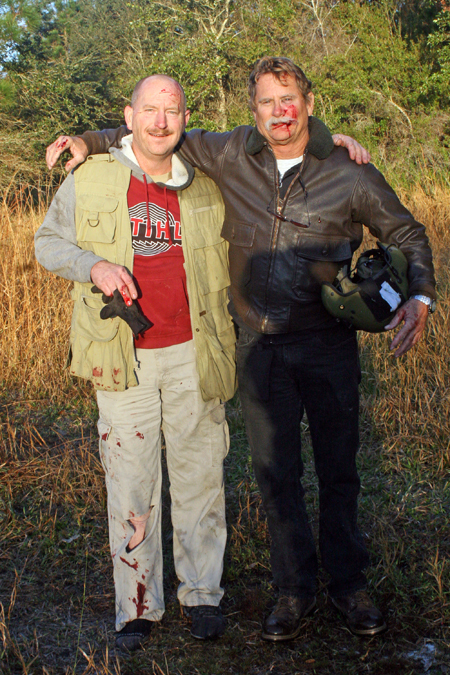 John Strayer, left, and pilot Graham Harward are bloody but unbroken. A few hours later at the crash site. 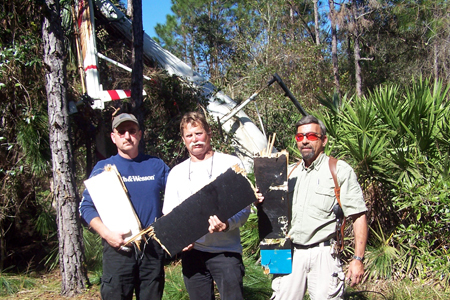 John, Graham, and Mas with pieces of main rotor. Don’t be surprised to find out that the aircraft ran out of gas. This is a common cause of such incidents. Mas, Glad to hear you and your friends are OK! Just read your blog about the crash. I am just glad to hear that everyone walked away from it. Said prayers of thanks that you’re all okay! I was concerned when I first heard and happy you all survived and are intact. I knew pig hunting was hazardous but the little buggers are downing helicopters now? You might want more than an N-Frame next time you go out! Very glad to hear that you and John are both well, and all kudos to Graham Harward for bringing you down safely. If you can walk away from it; it’s a good landing. Glad to hear you are all ok. Sorry that the hog got away. Thankful that God had his hands around y’all. Glad your able to write and talk about the crash. Your blessed my friend. Glad everyone is OK. Not a fun way to land, and the hog got away. That must be one heck of a “bucket list” your working on there Mas. REALLY glad it worked out the way it did and no one was serously hurt. Very glad ALL THREE of you made it out of that incident relatively safely. I both admire your sense of adventure and wince at the risk surrounding the whole ordeal. Having taken one brief (but very enjoyable) ride in a Black Hawk, I can say that it’s a pretty amazing experience- but nonetheless, an experience fraught with unpredictable danger unlike that of any other type of aircraft. I also admire the many Americans who fly in helis (sometimes against their preference!) as part of their livelihoods and/or service to our country. They surely don’t get enough credit for the risk, courage, and skill such an endeavor demands! OH MY. I’m very glad there was a happy ending to this story! But I’m sure you had one more close call, when you returned to the evil princess, for scaring her half to death!! And I thought falling off our barn roof two years ago was tough. I knew I had angles and am glad you did too! I’ll bet that hog is still running! I’m glad you’re shaken, stirred – but not blended! One day I hope to take instruction from you. BTW, sub-lingual Arnica works wonders on bruises, for what its worth. Just read your post. I am happy you are ok. I immediately thought of Jose Wejebe who was killed last year in a private plane crash. There are some things people do that make me shake my head. Flying around in little aero devices is one of them. Mas so glad you and the other men are okay compared to what might have happened! I’ll stick to keeping my feet on the ground. Haven’t been in an airplane since ’95 and don’t plan on getting back in one anytime soon. Never been in a helicopter and never wanted to go up in one. Thanks but no thanks. Kind sentiments from all are appreciated! Glad you all are ok! We don’t need to give the Liberals even more reasons to take guns out of our hands! One of my most vivid memories is of being a passenger in a helicopter operated by the long defunct SFO Helicopter Airlines (the also operated hovercraft;) the flight went fairly low over San Francisco Bay on a beautiful clear morning. Trees would have made it a little too exciting. I’m very glad you and the others came through it OK.
Good heavens, and I mean that literally, sir. My husband and I are great admirers of you and your work and were fairly alarmed to hear of your accident. Thank God you and your friend were literally able to walk away. You’re needed too much at this time in our country to lose you in such a way. Take care! Mas, I am thankful to God for His having preserved you alive and unhurt. Another day vertical and breating is always a blessing. As to those above who suggest you “act your age”, stop “tempting fate”, taking risks, etc… hey, live life to the fullest until you don’t. I always say I’ll stop doing things when I get too old to DO them anymore… too many get old because they stop doing things. Keep full on until you can’t. Hey, I’d jump at such a chance, myself. I do think I’d bring a rifle with a bit more authority, though.. FN AR, maybe AR 10, something in thirty, I would think. I don’t know if you’ve ever eaten wild hog, I have, and oh my, are they tasty. Did one up in a Puerto Rican barbecue box one time… feasting fit for kings. Glad you are OK, and have one more crazy tale to tell. Wow! Mas & John & pilot, I am so thankful you all are all well. Maybe you all should consider attending brother Herman’s church services a little more often after this experience. 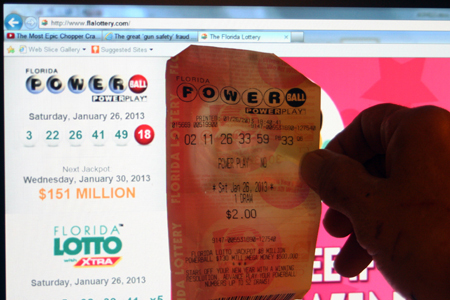 In any case I shall redouble my prayers for you all. Hope to see you all at Feb. Mag 40. I’ve never shot a hog, feral or otherwise, but stirring in the depths of my armchair I reach out and grab my copy of the 1998 ‘Guns & Ammo’ annual, and check the ballistics data on the back pages. I am actually really surprised that noone has taken Mas to task for using such a wimpy gun to shoot hogs with. .44 Magnum revolver wimpy!!?? Well how else would you describe a weapon which delivers less energy at the muzzle than a .223 rifle does at 100 yards? Also in the 1998 G&A annual is an article by Mas about the .45 Super. In the accompanying photographs he doesn’t lok appreciably older than he does now. Hmmm . . . walks away from helicopter crashes unscathed and doesn’t appear to age. Is there something Mas isn’t telling us? On the morning of this accident, I had taken my Aunt to the hospital ER. Several hours later, I walked past the waiting room and saw the man himself sitting calmly reading the paper. I froze unable to speak. He politely looked up and said “Can I help you?”. All I could manage to mumble was “your a hero of mine”. I am 6’9″ tall and as he stood to shake my hand it felt like he towered over me. He had a noticeable limp and blood stains over much of his clothes. Despite his hellacious morning, he was kind and personable. I was reduced to a bumbling idiot. We sat and talked for a few minutes and I found him to be every bit the hero I had hoped. I’m fortunate to have met the man and we are all fortunate to still have Massad Ayoob with us! I plan to see him again, next time at a MAG training class. 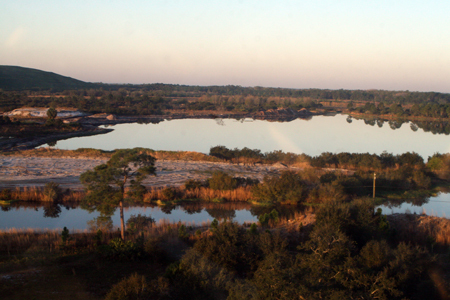 Lwofjax, welcome to the blog and thanks for the kind words. How is your aunt doing? Mas – My Aunt of 91 is recovering nicely from a rotator cuff injury. She will be returning home this week or next. Thank you for asking. I’m currently reading “Combat Shooting”. Once finished, I plan to enroll in a MAG class in Live Oak per your reccomendation. Thanks again for being so approachable in such a difficult time. I’m glad no one was seriously injured. 1. There wasn’t time for fear when it was happening, only to follow procedure to mitigate injury as it was going down (“crash position”), get selves and pilot out of the thing once it was down, and get the hell away from it before it caught fire, which it fortunately did not. 2. Nothing I COULD have done to change it. 3. A renewed appreciation of life and a bit of survival euphoria, as is typical after near death experiences. Too close for comfort, Mas. I always though helicopters were just optical illusions; I mean, they don’t look like they can fly. Ahem! Maybe I should reassess. All seriousness aside, very glad you all were able to walk away. My father died in a small airplane crash when I was 7 yoa. We count our blessings while we can. Sounds like it was fun leading up to the problem. Care. Glad you made it! Not time to go yet. Quite the adrenal rush, huh? I am glad you are OK.